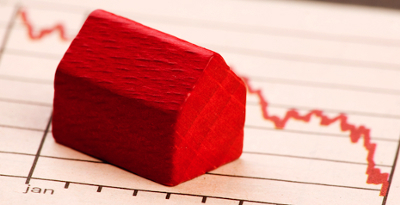 The latest Central Statistics Office (CSO) September 2014 release is mixed news for the construction industry and for those tasked with solving the housing crisis. Construction is improving, however residential activity and output is decreasing. See link to CSO webpage here. Quote: “The volume of output in building and construction increased by 4.1% in the second quarter of 2014 when compared with the preceding period… The annual rise in the volume of output reflects year-on-year increases of 23.4% and 8.5% respectively in non-residential building work and civil engineering. Not good news for policymakers attempting to deal with spiralling rents, house prices and supply issues. Indeed not good news for consumers, housing lists or first-time buyers. This reinforces anecdotal accounts of a Dublin-centered commercial property resurgence and runs counter to recent media spin on the issue. Reduced residential activity is marked by a continuing fall in commencement notices since implementation of new building regulations S.I.9 in March 2014. Current levels are 30% below 2013 levels, a historic low for construction output. The volume of output in building and construction increased by 4.1% in the second quarter of 2014 when compared with the preceding period. This reflects increases of 9.3% and 4.7% in civil engineering and non-residential building respectively while there was a decrease of 1.9% in the volume of residential building*. The change in the value of production for all building and construction was +5.9%. See tables 1(a), 1(c), 2(a), 2(b) and graph. On an annual basis, the volume of output in building and construction increased by 10.1% in the second quarter of 2014*. There was an increase of 11.1% in the value of production in the same period. See table 1(a). The annual rise in the volume of output reflects year-on-year increases of 23.4% and 8.5% respectively in non-residential building work and civil engineering. 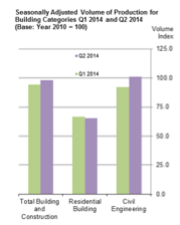 Residential Building decreased by 8.8% in the year to Quarter 2 2014. See tables 1(c), 2(a), 2(b) and graph.